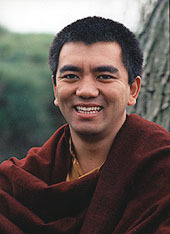 The Seventh Dzogchen Rinpoche, Jikmé Losel Wangpo (Tib. འཇིགས་མེད་བློ་གསལ་དབང་པོ་, Wyl. 'jigs med blo gsal dbang po) (b.1964) was born in Sikkim, into the Lakar family, as the son of Tsewang Paljor and Mayum Tsering Wangmo. Jikmé Losel Wangpo was recognized by Kyabjé Dodrupchen Rinpoche as the seventh in the line of Dzogchen Rinpoches, which began with the great 17th century master Dzogchen Pema Rigdzin. From an early age, he received teachings from many of the greatest Tibetan masters of the last generation, including Kyabjé Dudjom Rinpoche and Kyabjé Dilgo Khyentse Rinpoche. After his initial studies with his tutor Dzogchen Khenpo Rahor Thubten, he went to Dharamsala, where his education was closely supervised by His Holiness the Dalai Lama, and he spent seven years at the Buddhist School of Dialectics before graduating with the degree of Rabjampa. He is now the head of the newly established Dzogchen Monastery in Kollegal, in southern India, and since 1985 he has travelled widely giving teachings from the Dzogchen lineage in a direct and practical manner. 1994-1999, teaching on the Thirty-Seven Practices of the Bodhisattvas. For more details, see here. This page was last edited on 23 April 2012, at 14:12.